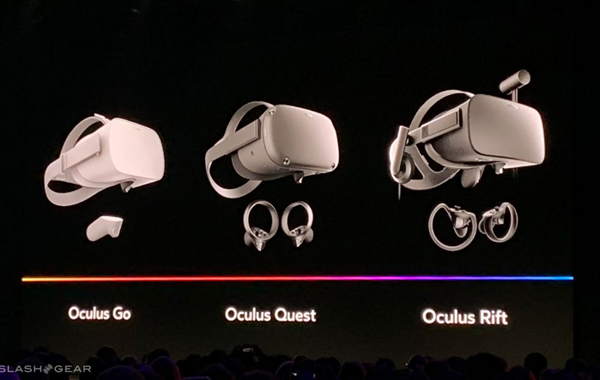 Having watched the Oculus Connect 5 keynote and seeing the follow-up coverage, I think Facebook definitely has some amazing innovations coming around the bend – well earned and hopefully well-publicized innovations. The hardware looks seamless and easy to adopt, there appears to be enough horsepower for half-decent VR experiences, and it does away with the confusion of mixing smartphones and VR clamshells to deliver the experiences that many customers want. While the Quest is marking a new direction for Oculus, I think they need to tread carefully as their choice of positioning could inadvertently dilute Facebook’s VR market strengths and the full realization of virtual, augmented, and mixed reality. I’d be interested to hear if readers agree or disagree with this assessment. First, let’s talk about the gaming console business. For decades, console games have received priority by game developers with their PC versions being released afterward with some visual enhancements like better graphics, higher resolutions, and in some cases bigger game maps. It works out this way because developers prioritize where they will ultimately sell more units, and it hasn’t been all that damaging to them to treat PC as a second fiddle. While PC gamers would have preferred a different model, they have come to accept this as a fact of life. Now let’s look at the above comparative table (sourced from Jon Peddie Research) of mobile to console to PC processing power. The PC always comes out on top and provides more processing power year over year in the CPU, the CPU memory speed and size, the GPU, and the GPU’s memory and size. 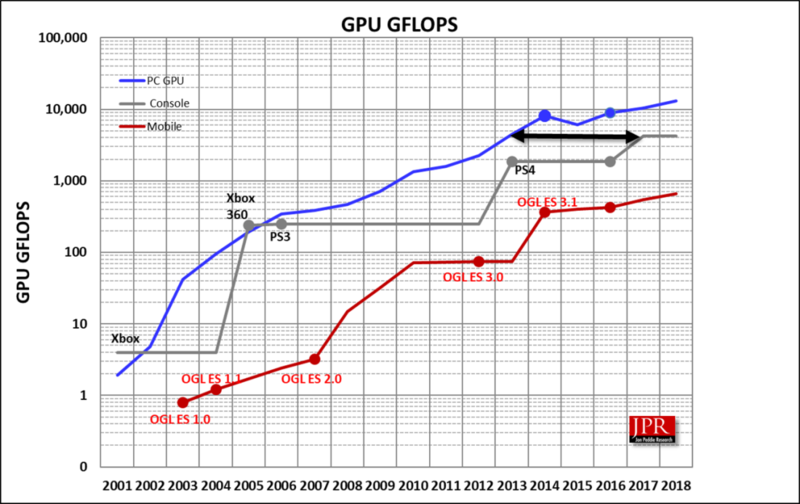 In the past, the consoles have had brief periods where they were at the same computational level as a PC, though quickly lost out as PC enhanced and console plateaued while it waited for its next iteration console release. Finally, we have mobile which is easily 10 years behind PC, and 3 – 5 years behind consoles. Developers get away with the simultaneous mix of console and PC releases because despite only being a few years apart computationally, there is still enough to show an impressive difference in quality between PC and console. Mobile, on the other hand, is its own animal. The games are relatively simple, the graphics not too intensive – it’s mobile. Sure, VR has a strong play here; but that’s just it. It’s about the play versus the true vibrance and complexity of the graphics. Now we get to Facebook’s Oculus. Oculus is taking the angle of “we’re a console now”. The new Oculus Quest is based on a Snapdragon 835 mobile chipset, it has full positional tracking which I’m sure is impressive, the resolution is superior to that of the original Oculus Rift, and the HMD comes with its own set of Touch controllers. It’s all amazingly good on paper. The messaging Oculus is telling developers is “it will only take you a few weeks to port your existing Oculus Rift PC VR games to Oculus Quest”. In other words, they are advising their best AAA developers to code for Quest first (because that’s the lowest common denominator), and then enhance for their other platforms. I’m concerned that this could spell trouble in more ways than one. Looking back at that processing map, this is a far worse scenario than consoles and PC titles being simultaneously released. At least with PC and console, there is a commonality between them which maximizes to about three to five years of processing power difference over time. Relative to PC, Oculus is effectively telling developers to code for 10 years ago, and beef it up as need be. 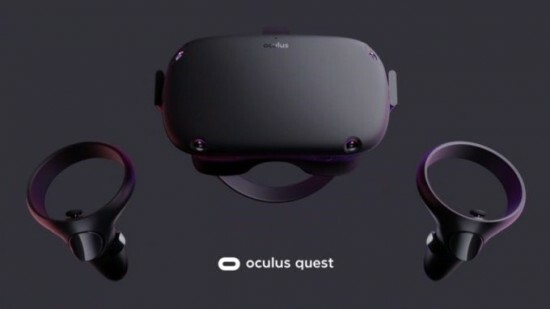 In fact, the difference is potentially higher with time because similar to the way a console plateaus over years, the Oculus Quest platform would need to do the same while their PC counter-part is aggressively increasing its potential year over year over year. 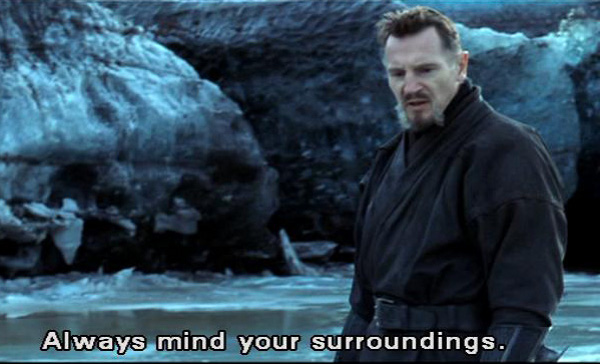 So, we’re talking anywhere from 10 to 15 years of processing power difference between the Oculus Quest and the computing VR potential of a gaming PC. So today, we are looking at shiny pixels in existing titles that have scraped away the eye candy to squeak through on both the Quest and PC platforms. In a year or two, I think we’ll have real problems because there is no way a title originated for the Oculus Quest is going to benefit from the real graphics intensity that PC has the ability to deliver because the media are so far apart. 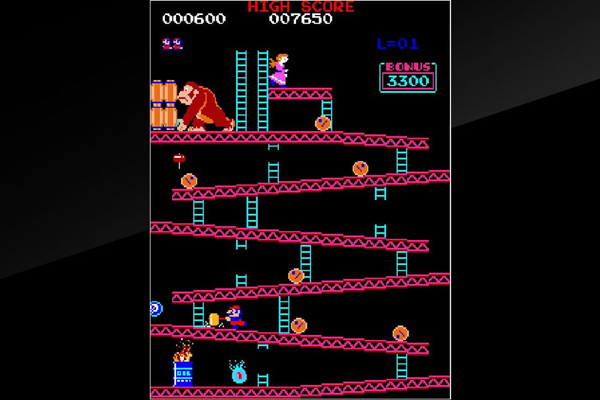 It’s like me saying take that smartphone Donkey Kong game of yours, and turn it into 3D movie-form Wreck it Ralph – just make sure it works on both platforms. There is a secondary problem too. When Oculus got their start, they had the benefit of a full PC ecosystem to promote them and market on their behalf. Why? A computer-hungry VR device is a solid justification to buy better CPUs, graphics AIBs, motherboards, and everything else a VR-hungry gamer needs. Even in limited quantities, power-hungry immersive technology has a pretty wide reach in the PC ecosystem. However, if we’re dealing with content that is backward scalable to graphics deliverables that are ten or fifteen years old, what’s in it for the PC manufacturers? Suddenly, Oculus is left to their own devices to market their sole product because they’ve scraped away the benefit for a wide PC ecosystem to take an interest in what they are selling. What’s in it for the PC customers? It’s for these reasons that I think it’s a dangerous game for Oculus to promote the “you can code for all our platforms” ideology because they are missing this cardinal rule: the medium is the message. The PC is not a mobile platform. It needs to be filled with the best and most complex ideas and content the market has to offer – not some mobile game PC up-conversion. If my logic holds true, Oculus may have to take their lumps to get around this by having fewer yet far more robust titles available on PC than on Quest to effectively satisfy and benefit from both media forms. They can’t afford to lose the excuse for customers and the PC ecosystem to support and promote their brand, and the only way to do that is to have content that justifiably needs the high-performing hardware it’s running on. If Oculus loses that supportive hardware umbilical cord (and that’s really what it is), I think they will have a much bigger and riskier hill to climb. With the advent of AMD providing their custom APUs for the Microsoft and Sony consoles (plus two new Chinese consoles), the game developers can develop once and introduce a new game to all platforms at the same time. They’ve been doing this since 2015, and instead of trying to scale up a console version, they now scale down a higher quality PC version. Also, the game developers have also woken up to the fact that Gaming PCs outsell consoles almost three-to-one. The International Future Computing Association will be holding its next membership meeting prior to the IMMERSED 2018 conference on November 7, 2018 in Toronto Canada. Readers are welcome to join TIFCA so they too can participate with the meeting either locally or remotely.